square kilometers annually. According to the United Nations, desertification is potentially the most threatening ecosystem change impacting livelihoods of the poor. See more disturbing and interesting desert facts below. Drought has been labelled “the silent killer”. Each year, an area of fertile soil the size New Mexico or Poland is swallowed by desserts and made useless for farming. Often in areas where people already are starving. In Africa alone, 36 countries are affected by desertification or land degradation. Some estimate that 75 percent of the entire continent’s farmland is rapidly losing the basic nutrients needed to grow crops. The main reasons why deserts are growing are climate change and human activities such as too intensive farming, poor irrigation and clearing of forests. Today, growing deserts are threatening an area larger than the combined area of the US, India, China and Russia (40 million square kilometers). We can reverse the development ! Think about this: every year we lose about 42 billion US dollars worth of agricultural products because of desertification and drought. Taking action to prevent this loss would only cost 2.4 billion US dollars per year. The world’s deserts grow about 120,000 square kilometers annually. According to the United Nations, desertification is potentially the most threatening ecosystem change impacting livelihoods of the poor. 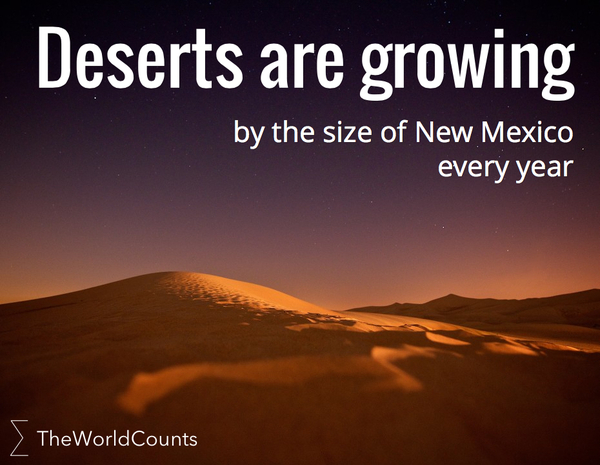 Interested in more facts like the growth of the world's deserts? Then plug in and subscribe to our newsletter.